I have a slight obsession with glass jars. I save jars from food, candles and anything else I can get my hands on. I pick them up at rummage sales and pluck them from my friend’s home who are trying to recycle them. 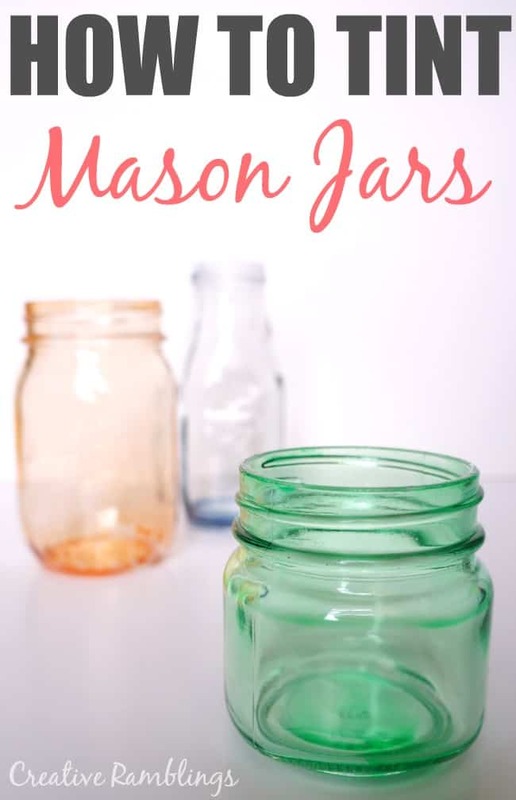 There are so many beautiful crafts you can make with jars, why buy them when you can reuse a few you already have. 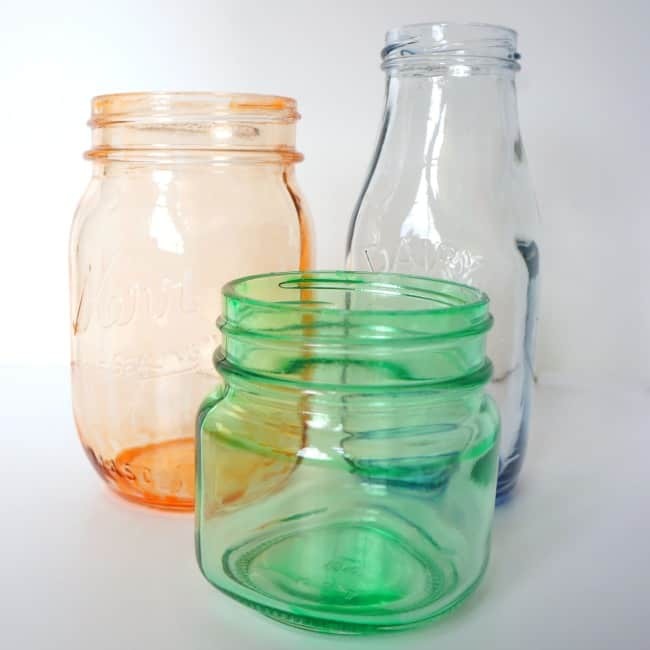 This being said, I do love colored mason jars. But they are pricey and often you have to buy them in bulk packs. I thought I would try my hand at tinting a jar on my own. 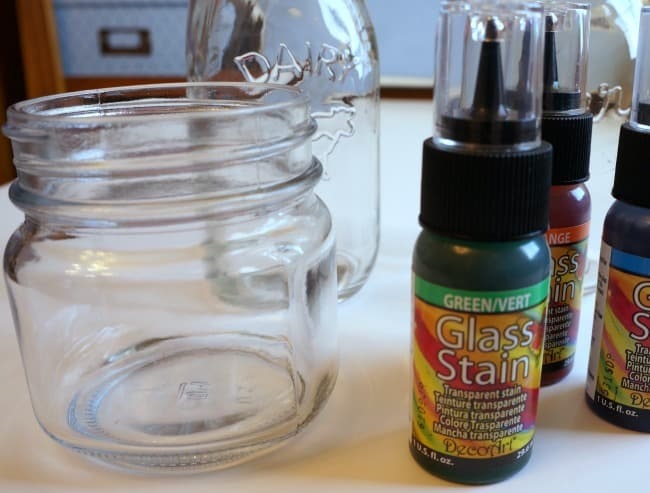 I found that with the right product it is easy to tint glass mason jars and the result is lovely! I started with 3 glass jars and DecoArt Glass Stain. This is the key, and only, ingredient I used to tint glass jars. 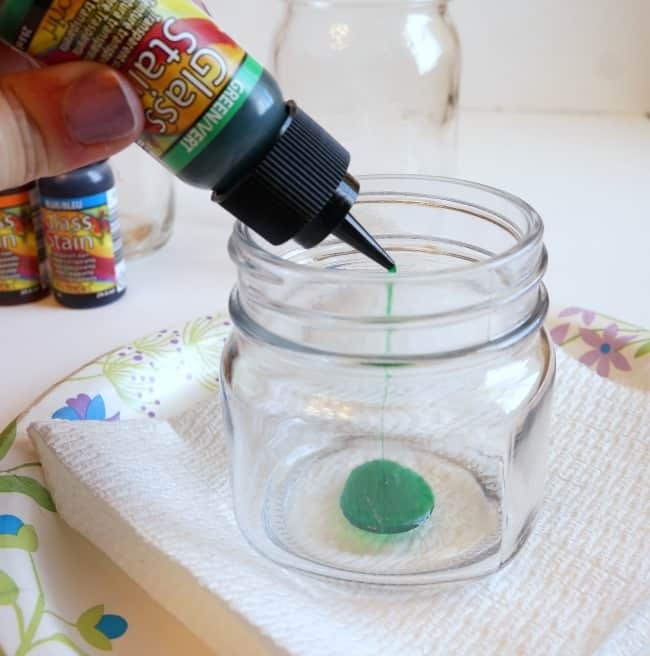 DecoArt was kind enough to share a few colors of this pretty translucent glass stain with me so I could show you just how easy it is to tint glass. I cleaned my jars and then, one at a time, squirted a good amount of glass stain into the bottom of the jar. I swirled the stain around the jar until the inside was completely coated. Then held the jar upside down until most of the remaining stain dripped out. 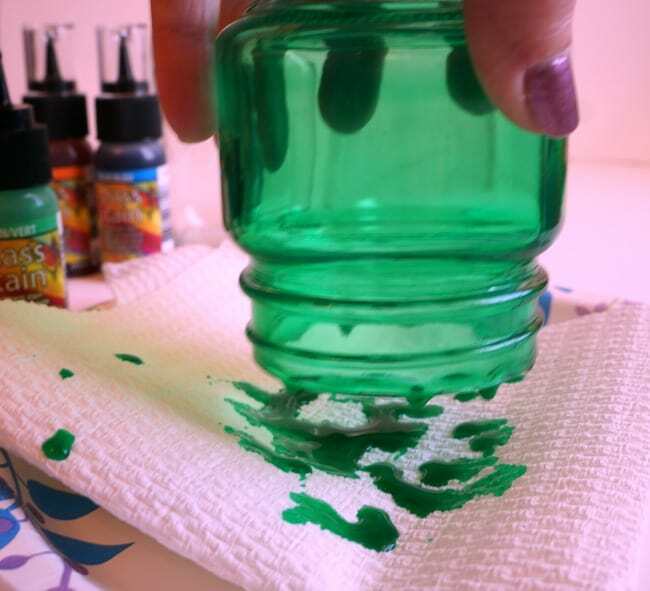 Once most of the stain had dripped out, I set the jar upside down on a paper towel to let any remaining stain drip out and the jar to dry. I then stood the jar upright until the stain was completely dry. 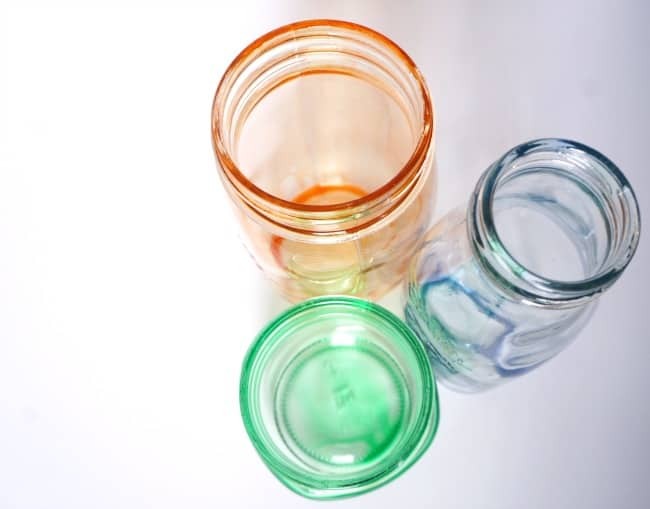 I tinted three different types of glass jars. Each has a beautiful color and translucent finish. Because the stain is on the inside of these jars I won’t be able fill them with water or anything liquid, but they make a pretty centerpiece especially when the light catches them. 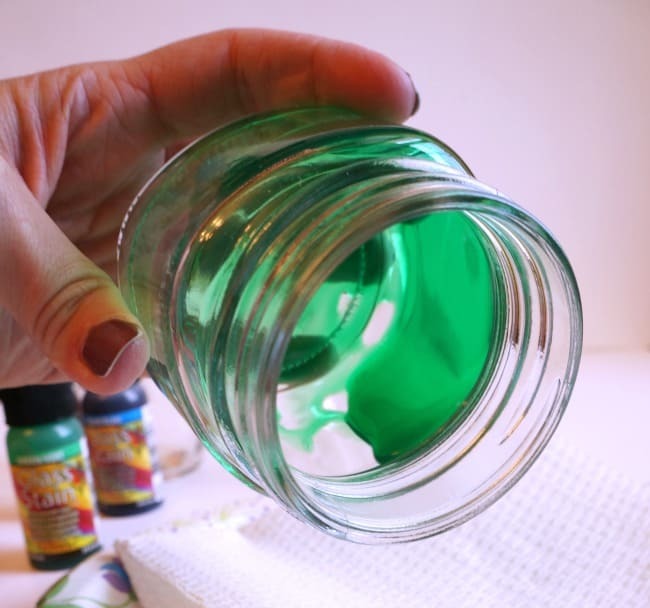 Have you ever tried tinting glass? What color would you choose? I’ve tried the oven baking method and got so so results too. This is way better! Hi was wondering if you could put tint on outside then can use for water and flowers? Hi Lori, yes you definitely can. You can paint this tint on or use the technique in this post. Check this box for access to free craft templates and exclusive content!